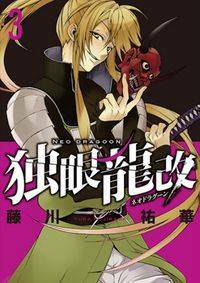 Neo Dragoon follows Masamune, a young, one-eyed general, in 1581, the Feudal era of Japan. The story begins in Castle Yonezawa, where Masamune lives under his father’s rule. He is ordered into his first battle: to reclaim the Igu territory from the enemy. Masamune is very ambitious and not only does he plan on ruling the neighboring lands, he envisions himself ruling over Japan and beyond it. He surrounds himself with loyal, smart and strong friends like Katakura Kojuurou, his second in command, Date Shigezane and Harada Munetoki, his lieutenants. His wife, Megohime, is beautiful and also skilled in combat. As Masamune takes his first step on his journey to conquer the land, the country and eventually the world, what perils await him?